The title of this post is a pretty big question. Popular media accounts of links between religion and racism are not hard to find (for example, this recent story about a prison inmate suing to receive racist literature on the grounds that it is part of his faith). A recurring theme in discussions of racism and religion is the idea that religions are like “clans” and help us divide the world into people who are in our group and people who aren’t. This mode of thinking might spread from religion to other social categories, such as race. Thus, two things that at first don’t seem related (religion and race) are connected by our general tendency to think in an “us” versus “them” fashion. For sure, it’s not hard to think of examples of groups who promote both racial and religious hatred. The Ku Klux Klan is just one such group and also an example of when religion is associated with harm. The question of whether religion causes racism is an important part of the public debate over whether religion is responsible for more harm or more good. It’s easy to come up with examples of both. Religion has been cited as a motivation for all kinds of harm, from the Crusades to the persecution of women. But it also is given credit for inspiring profound acts of charity and for leading to better health and longevity. The overall good and bad created by anything, of course, is enormously difficult to calculate, and it depends a lot on what you personally value (for example, is prejudice more or less important than longevity?). Smaller questions about individual goods and bad, however, are much easier to answer. So what does science have to tell us about religion and prejudice? Overall, how religious a person is (their religiosity) seems to be associated with racism–at least in the US. Three researchers, Hall, Matz, and Wood (2010), reanalyzed the data from 55 studies on religiosity and racism. They concluded that religiosity is related to racism, but whether that relationship is positive (more religiosity means more racism) or negative (more religiosity means less racism) depends on the motivations people had for being religious. People who are intrinsically religious are motivated by their personal conviction and belief, and this type of religiosity was negatively related to racism. A quest orientation towards religion–the view of religion as a kind of flexible searching–was also negatively related to racism. People who are extrinsically religious, on the other hand, are motivated by what appearing religious can get them. This type of religiosity was positively related to racism. In addition, fundamentalism (which is positively correlated with extrinsic religiosity) was positively correlated with racism. However, the correlations of extrinsic religiosity and fundamentalism with racism appeared to get smaller over the years. Earlier studies reported larger correlations than later studies. This is consistent with findings that overt or explicit racism has diminished over the last 50 years. Also worth noting is that the overall relationships were smallish, especially for the intrinsic and quest orientations (r = -.07 to .17 for stats savvy people). This doesn’t mean that the correlations aren’t real or important, just that religion only accounts for a small amount of the differences we see in how racist people are. For something like prejudice, however, small differences can mean a lot. If each of us became just slightly more racist, the total effect of this could be quite large when considered at the societal level. So it seems pretty clear that racism varies with religiosity. But just because the two change together doesn’t mean that religion causes racism. To answer our original question, we should look at experimental evidence, which can help us understand causation a little better. It might seem at first that religion or belief in religion is not something we can manipulate in an a person, but there have actually been some very clever studies that have done just that, and these can help us answer the question we started with. I’ll cover just one of them in this post, from a group of psychologists from Baylor University, Johnson, Rowatt, and LaBouf (2010). These researchers actually conducted two experiments to investigate a possible causal relationship between religion and racism. In both experiments, religion was made more accessible (more likely to be thought about) by a technique known as subliminal priming. During a task unrelated to religion or race, prime words were flashed on the screen. They appeared too briefly for participants to become consciously aware of what the words said but long enough for their meaning to register outside of conscious awareness. For half of the participants, the prime words were Christian-themed (for example, Bible, faith, Christ), and for the other half, the words were neutral (for example, shirt, butter, switch). 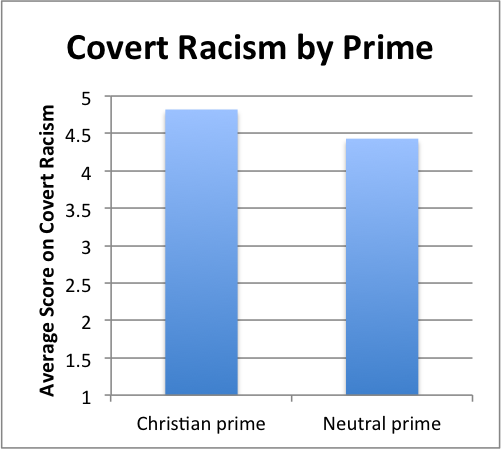 Experiment 1: Participants showed more covert racism when primed with Christian rather than neutral words. Click to enlarge. There were no differences between the groups on the warm/cold measure. However, participants who were primed with the Christian-themed words showed greater prejudice on the second task than participants who were shown the neutral words. You can see the difference in the first chart on the right. Each bar represents that group’s average score on the second prejudice measure (on a scale of 1 to 5). 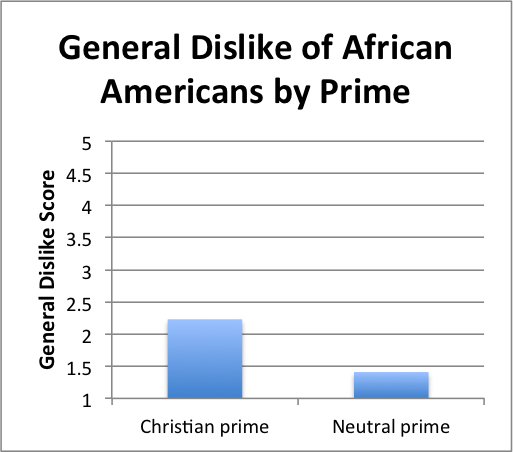 Experiment 2: Participants primed with Christian rather than neutral words showed more disliking of African Americans. Click to enlarge. Wanting to understand more about what was driving this difference, the experimenters recruited another sample of participants for a second study. The first part of the study (priming) was the same, but participants completed a different set of measures of racial prejudice. Previous research has suggested that prejudice towards different groups may be driven by different emotional reactions. Prejudice towards African Americans is associated with fear. Participants in the second study completed a scale measuring negative emotional reactions to African Americans. This scale asked how much fear, disgust, and dislike participants felt towards African Americans. Interestingly, participants primed with Christian words felt more dislike for African Americans but not more fear or disgust. You can see this effect in the chart to the right. This scale went from 1 to 9. Together, the two studies demonstrate that increasing the availability of Christian religious ideas increased prejudice towards African Americans but not because participants felt more fear or disgust. So, Does Religion Cause Racism? At first glance, these studies seems to provide good evidence that religion causes racism. However, there are reasons to question this conclusion. First religion is not a single, unitary thing. (In fact, there are scientists who claim that religion is not a scientifically valid concept.) We should be very skeptical when we read claims about religion, generically speaking. What, exactly, is meant by that word in a given context? Sometimes, religion means belief in God; other times, it means participation in ritual involving the supernatural (such as baptism); at yet other times, it means belief that things in the world have a purpose or meaning beyond their mere physical existence. So which aspect of religion, precisely, is meant to cause racism? Going back to where we started, the most obvious idea to call on is religious affiliation as a kind of social category–a way of dividing people into ingroups and outgroups. This might make sense in the context of extrinsic religiosity. If extrinsic religiosity can be motivated by a desire to signal group affiliation, then it might be related to how much people think in an “us” versus “them” fashion more generally, including about race. This is just a guess about what is going on, but it’s something that can be studied. So our final answer is maybe, and only maybe if you mean the right thing by the question. Even still, the effect may not be driven by religion in any unique way. Instead, it could be part of a general human tendency to divide the world into people like us and people not like us, something we do with any kind of information, whether that is religious affiliation, race, hometown, or even made up groups. And if religion does cause racism, does that make religion bad? This isn’t really a scientific question, but there are many more scientific facts that should be considered in answering it. The same process responsible for religion’s association with racism racism may also be responsible for a lot of the charitable giving associated with religion–a topic for an upcoming post. Please feel free to share your thoughts on religion, racism, and research. However, comments expressing bigotry will not be approved. Where is the experimental evidence to prove that subliminal priming has any effect on test subjects’ responses to questions? Are there any peer-reviewed studies that provide a reason to have confidence in this method? I’d like to know what they are. Thanks for this comment! I am at a the APS conference this week, but I will answer your question about subliminal priming as soon as I can sit at my computer long enough to do so!